For the building industry, the installation of photovoltaic systems has become a new field of activity. Interest in solar energy is growing and future business prospects are excellent. Photovoltaics for Professionals describes the practicalities of marketing, designing and installing photovoltaic systems, both grid-tied and stand-alone. It has been written for electricians, technicians, builders, architects and building engineers who want to get involved in this expanding industry. 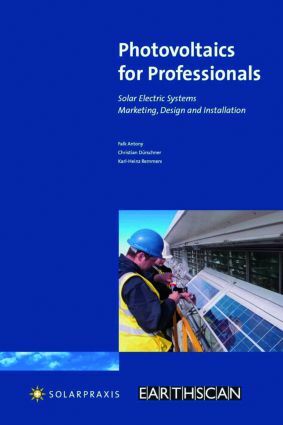 It answers all the beginner's questions as well as serving as a textbook and work of reference, provides designers and installers with practical specialist knowledge needed to design and install high quality solar electric systems and gives a comprehensive overview of the major photovoltaic market sectors. Photovoltaics for Professionals contains over 100 full colour illustrations and covers: Marketing and promoting photovoltaics Solar cells, PV modules and the solar resource Grid-tied PV systems Stand-alone PV systems Practical step-by-step examples are described of how to go about installing systems right from the first customer contact and many useful tips are given to help avoid mistakes.